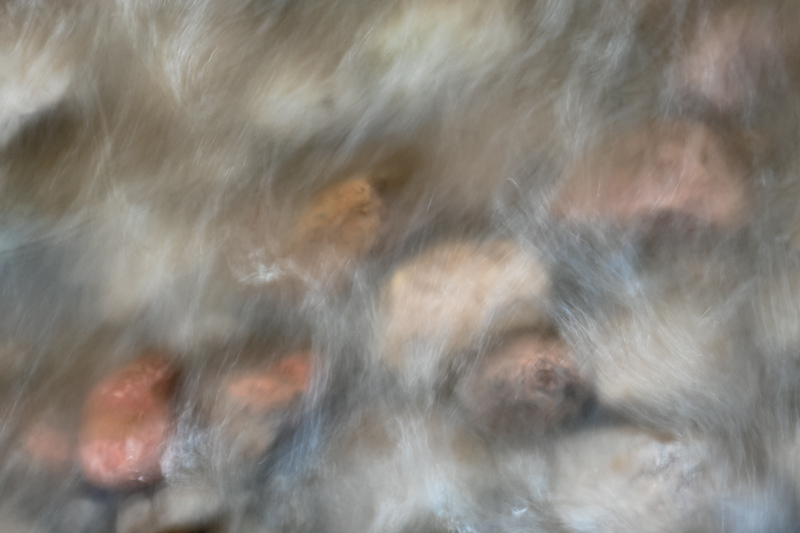 Big fan of water and slow shutter speeds. I like this image with the diagonal rocks. Two nice triangles top L and bottom R.
A small nit, I might crop out some of the top left and play with adding more contrast. Wonderful effect-so many ways to see this-makes a great abstract with nice shapes and colors. I like the gossamer effects of the water. Oh, I see a face in there-sideways bottom right, the single reddish stone among the white ones ! Leigh, a beautiful abstract. The speed of the water is perfect. Print it large — it would be a great conversation piece. Lovely dreamy effect with the water, Leigh. I think a touch more colour in the rocks would be even better - but that's just my feeling.